Get here NDA Mathematics Answer Key 2019 Set A of exam held on 21 Apr 2019. Candidates who got Set A question paper in Maths of UPSC NDA/NA 1 2019 can check its answer key from this page below and download PDF. This NDA answer key contains correct answers of 120 questions asked in Mathematics Set A Question Paper. You can estimate marks out of 300 by using the NDA Maths Set A Answer Key before declaration of result of NDA 2019. 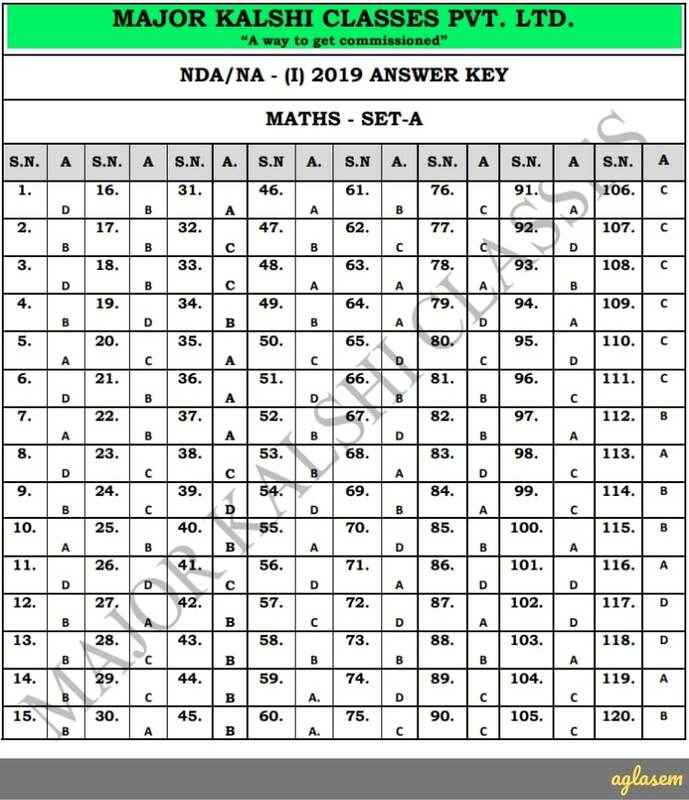 NDA Mathematics Answer Key 2019 Set A can be checked given below after exam. Latest: Answer key of NDA 2019 Mathematics Set A, Question Paper, Expected Cut Off, Student Reactions, Analysis are now available. UPSC releases official NDA answer keys a long time after exam. Therefore the answer key of NDA 1 2019 Maths Set A that you get here just after exam is unofficial. However, we put all our efforts in ensuring that you get here correct answers of NDA Mathematics Set A Question Paper. Now that exam has gotten over at 12:30 PM, you can enter correct answers in the real time answer key of NDA 1 2019 Mathematics Set A below. Click here to download answer key of NDA 1 2019 Mathematics Set A PDF. PDF version of the NDA 1 2019 Mathematics Question Paper of Set A is now available here after exam. How to calculate marks using NDA Mathematics Answer Key 2019 Set A? Therefore, marks as per answer key of NDA 1 2019 Mathematics Set A = 2.5*Correct answers – 2.5/3 * Incorrect answers. The answer Key released for NDA 2019 is of significant importance. With the help of the NDA Answer Key 2019, the candidates can cross-check their answers and calculate their probable score. The marks calculated using the NDA Answer Key is the probable score which a candidate may obtain in the exam. The answer key provides the candidate an estimate on their qualifying status in the exam. Note that the result is prepared on the basis of the final answer key. Hence, it is advised to the candidates to submit objection inn the key if they are not satisfied with the response marked in the key. How to use NDA Answer Key 2019? The candidates have to use the NDA 2019 Answer Key for cross-checking their answers and calculation of marks. The candidates need to add marks for a correct answer and deduct marks in case of an incorrect answer. The addition and deduction of marks is to be done as per the marking scheme. Follow the marking scheme provided below for cross-checking their answer using the UPSC NDA Answer Key. NDA is conducted in two stages – written exam and Service Selection Board (SSB) Interview. The candidates are shortlisted for the Interview on the basis of marks obtained in the written exam. UPSC prepares final merit list based on the total marks secured in written exam and SSC Interview. The National Defence Academy NDA & Naval Academy Examination is conducted twice annually in the month of April and September. Candidates between 16.5 to 19.5 years of age, who have completed 10+2 are eligible to appear for the examination. The exam is conducted to shortlist candidates for Army, Navy and Air Force wings of NDA and Naval Academy (10+2 Cadet Entry Scheme). Let us know your feedback on NDA Mathematics Answer Key 2019 Set A in comments below. To discuss any question of NDA 1 2019 Mathematics Set A also you can comment below. NPAT 2019 Form Closing Apply Now! !